Financial engineers have access to enormous quantities of data but need powerful methods for extracting quantitative information, particularly about volatility and risks. Key features of this textbook are: illustration of concepts with financial markets and economic data, R Labs with real-data exercises, and integration of graphical and analytic methods for modeling and diagnosing modeling errors. 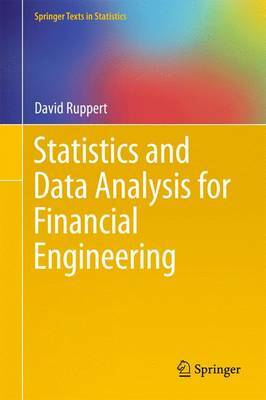 Despite some overlap with the author's undergraduate textbook Statistics and Finance: An Introduction, this book differs from that earlier volume in several important aspects: it is graduate-level; computations and graphics are done in R; and many advanced topics are covered, for example, multivariate distributions, copulas, Bayesian computations, VaR and expected shortfall, and cointegration. The prerequisites are basic statistics and probability, matrices and linear algebra, and calculus. Some exposure to finance is helpful.